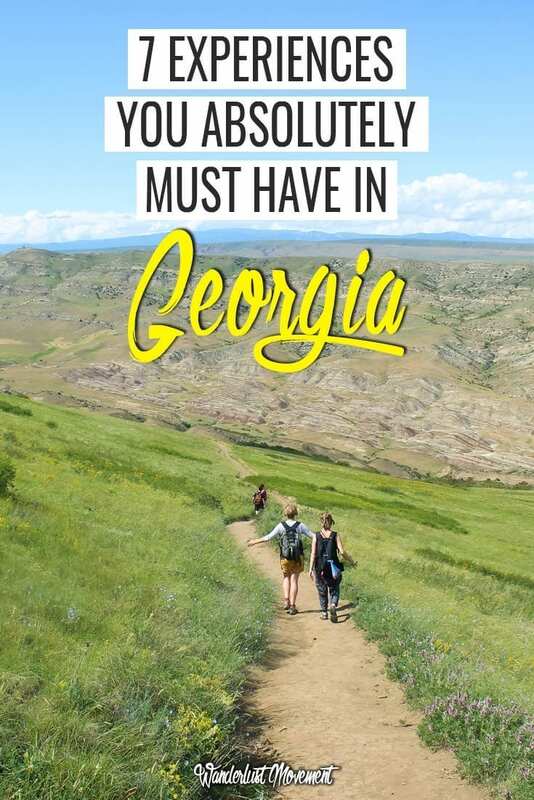 Visiting Georgia was a beautiful unplanned accident. It was literal proof that when things don’t go your way (*cough* being deported *cough* bag getting stolen *cough*), something better is on the horizon. After spending almost two months in this country, I still want to go back for more. Georgia stole my heart with its pristine hiking trails, ancient cobbled streets and the best bread I have ever had in my life. 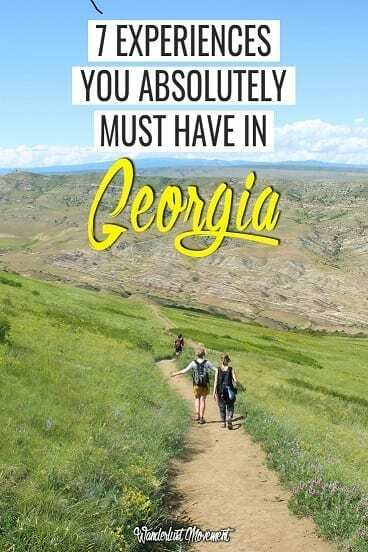 If you’re planning on following in my footsteps or just need some trip inspiration, here are 7 experiences in Georgia that you can’t miss! Traditional Georgian cuisine is a beautiful combination of East meets West. From dumplings to flatbreads that rival India’s best naan, eating here is a literal journey through cultures. But if you are a vegan traveller like me, you’ll have a hard time sampling some of the country’s most famous dishes. Luckily, there are still a few you can try that aren’t just salads. Khinkali is a soup dumpling that was brought to the region by the Tartars in the 13th century. But there is an art to eating this Georgian snack. First, grab onto the dumpling from its topknot. Then, bite a small hole in the side and slurp out the broth before feasting on the filling. Once you’re done, place the topknot aside and get ready to repeat. It’s quite impossible to have only one Khinkali. Plus they make great padkos (road food) while you’re exploring Tbilisi or travelling between towns. My favourite Khinkali fillings were the mushroom and potatoes. But if you eat meat, you’ll find plenty more options to try. If you’re vegan and looking for something more substantial, try lobio. It’s a dish made of kidney beans that has a consistency of soup served inside a traditional clay pot. Make sure you try it with mchadi (cornbread). It’s made from cornmeal, salt and water and is a delicious sidekick to your pot of beans. Badrijai Nigvzit (Eggplant Walnut Rolls). These are a lovely starter and are topped off with some cranberries. But I do think I would enjoy these more if they were served warm. Kazbegi is one of Georgia’s most popular hiking destinations. It’s surrounded by the towering Caucasus mountain range and is pure paradise for nature lovers. 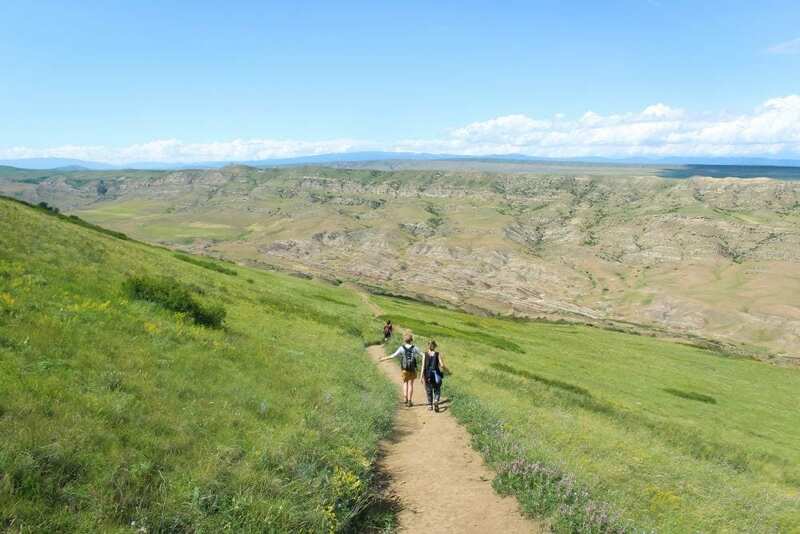 The region boasts some of the country’s best multi-day hikes, but if you’re short on time the trip up to Gergeti Trinity Church is 100% worth it. The walk talks about two hours to complete, and while it is easy, there is a steep gradient. The walk will take you through a village, a forest and eventually you’ll find yourself on top of a hill overlooking the valley below. With Mount Kazbeg in the background, this 14th-century church is arguably one of the most beautiful spots in the country. 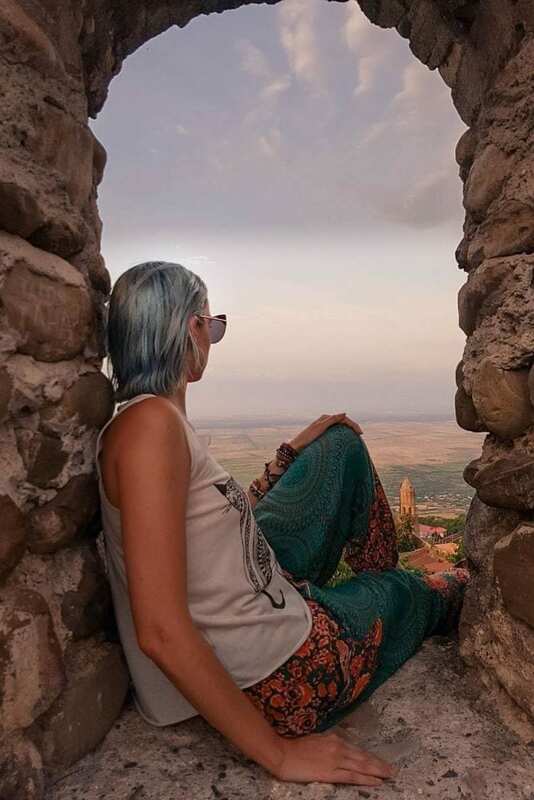 While it is possible to do this as a day trip from Tbilisi, you’ll need to spend the night if you want to reach the church before the influx of tourists arrive. Did you know that Georgia is the oldest wine region in the world? Or that they have their own unique method of making wine? A trip to this country would not be complete without indulging in its literal history. Telavi is set in the popular vineyard region of the Alazani valley. It’s only a two-hour marshrutka drive from Tbilisi with many wineries to choose from. While most travellers opt to join a packaged tour for wine tasting, it is possible to do it yourself. I hired a taxi driver for under R 200 to drive me to three different wine farms just outside of town. Before starting your journey, stop at the tourist information office to grab a map of the nearby wineries. You’ll be able to see which ones charge for tastings and which ones are free. I highly recommend Shuchman Wineries (they give you free snacks) and Shumi Wine Farm (they have a winemaking museum and free tours). Built in the 18th century by King Erekle II, Sighnaghi is a town that has resisted the modern world. Located in the heart of Georgia’s wine region high up on a steep hill overlooking the Alazani Valley its cobbled streets are lined with buildings over 300 years old. Sighnaghi is also surrounded by a 4 km defensive wall with 23 towers and six gates. While its views, history and wine are enough to attract most travellers, the main attraction is the Sighnaghi Wedding House. Open 24 hours a day, seven days a week couples flock to this small town to get married, thus earning it the nickname “City of Love”. 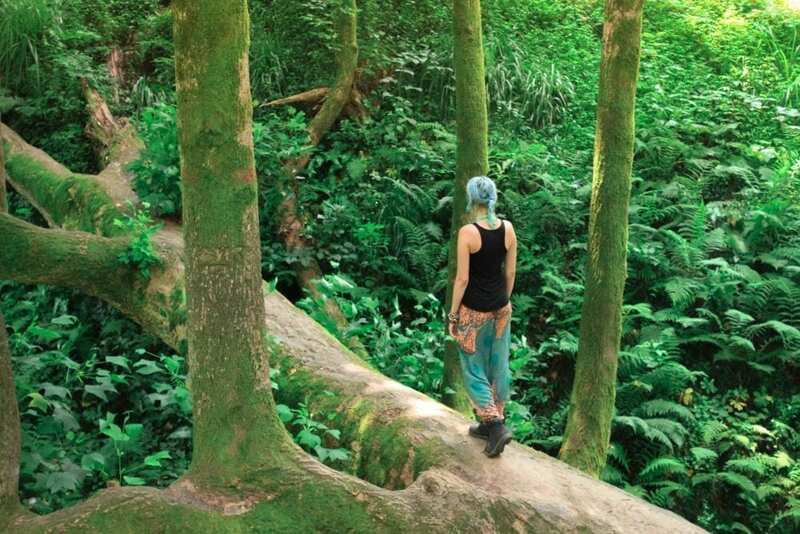 Situated along the banks of the Black Sea, lies the Batumi Botanical Gardens. Covering 1.13 sq km, it is easy to spend a day wandering through these beautiful gardens. From rose gardens to awe-inspiring lookout points and even a few history lessons, it’s by far one of the best things to do in the region. Entrance only costs GEL 8 (R43.00), and a marshrutka ride from Batumi is between GEL 5 to GEL 10. Make sure you pack your costume if you want to go for a dip in the Black Sea! 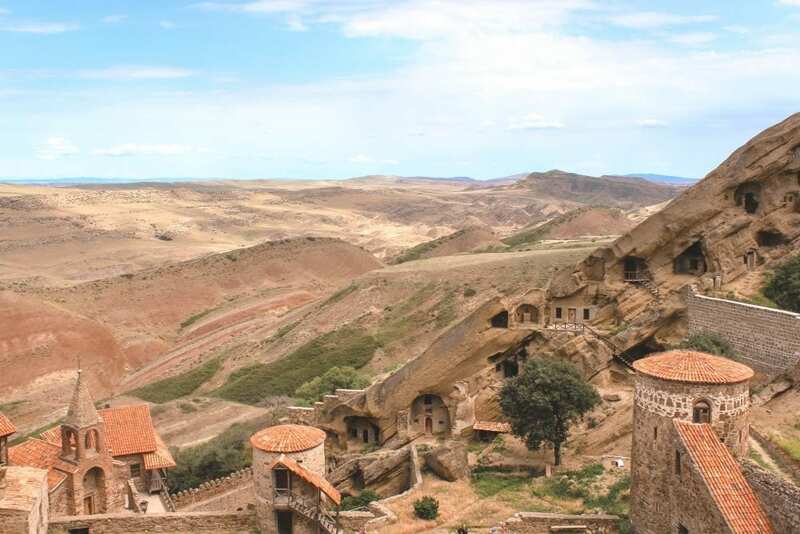 In the Kakheti region of Georgia, on the desert slopes of Mount Gareja lies the David Gareja monastery complex. While the monastery itself is impressive (it’s built out of the rock face), part of it is also located in the Agstafa rayon of Azerbaijan. This piece of land is a disputed border between the two countries, and as a result, you can be in Georgia and Azerbaijan at the same time. The area is not a tourist hotspot yet, but you can take a marshrutka direct from Freedom Square in Tbilisi. Fares cost GEL 25, and you’ll need to take a bottle of water and some snacks. 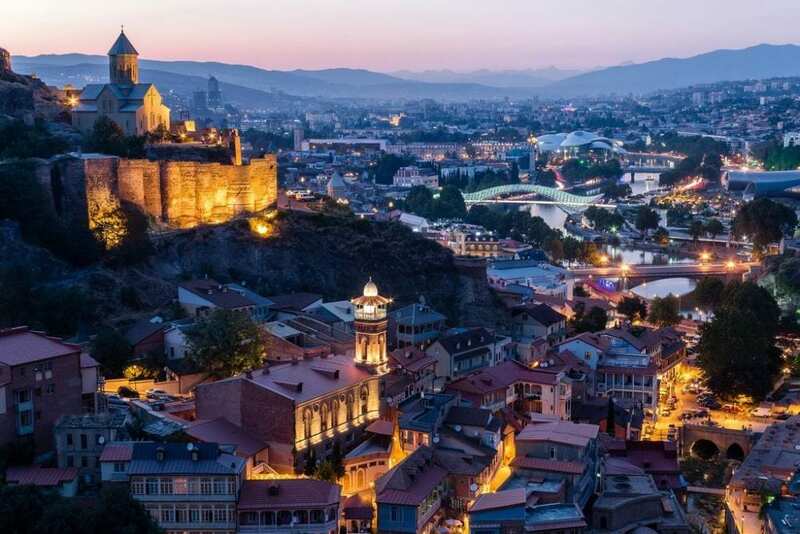 The ancient Narikala fortress is a symbol of Tbilisi’s defence. Built in the 4th century, it offers visitors some of the best panoramic views of the city. You can take the cable car up to the fortress for just GEL 1, but I’d recommend waiting until sunset. Not only will it be less busy than during the day, but you won’t find a better spot to watch the sun go down. Once you’re done, take the 1,500-metre trail back down. You’ll pass the Mother of Georgia statue, go around the fortress and end up at the entrance to the Botanical Gardens. Plus you’ll get some stunning views of the city as all the lights twinkle below. Are you planning a trip here? Check out my other posts on Georgia!